Apple has released new beta builds of iOS 10 to users enrolled in the developer beta and public beta testing programs. 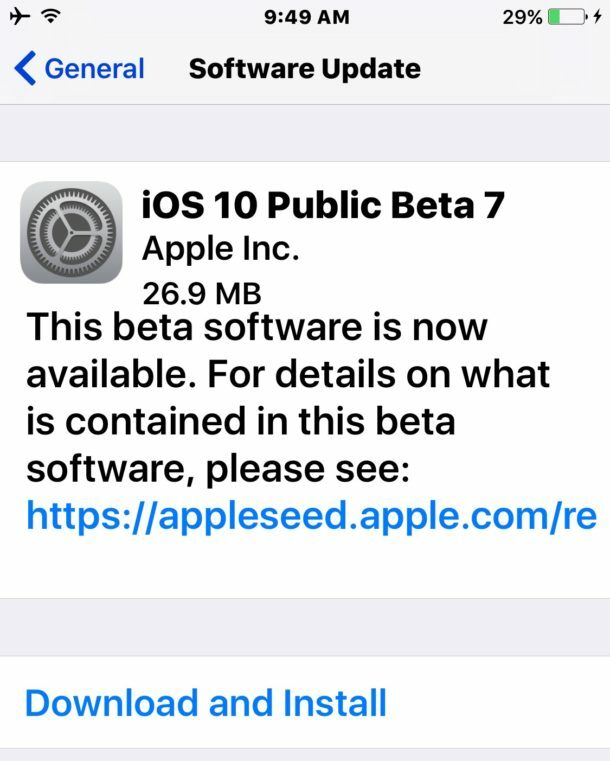 The latest developer beta of iOS 10 is beta 8, with a simultaneous iOS 10 public beta 7 release also available. The new 8th beta release is quite small as an over-the-air update, suggesting minor changes to the release, and should install quickly. Users running a prior iOS 10 build can find the latest versions in the Settings > General > Software Update section as usual. Beta updates typically include bug fixes and feature enhancements, but it’s also possible this new beta includes similar security patches like those issued in the widely available iOS 9.3.5 update that was just released for all iPhone, iPad, and iPod touch users. Some users who are attempting to install the latest iOS 10 beta are seeing the process get stuck on “verifying update” or an “Unable to Check for Update” error message. Both of these issues can typically be resolved simply by waiting a while and trying again, though sometimes a reboot may be required as well. Separately, Apple has released a new beta build of tvOS 10 for users running beta system software on their Apple TV. The final versions of iOS 10, tvOS 10, watchOS 3, and macOS Sierra are expected to be released this fall. Many users (me included) get an error message saying the update is impossible at the moment. I successfully installed the beta without incident, try again in a bit. The servers are always overloaded when they first come out. I’m just surprised we’re seeing betas released on a Friday, and so many of them. You’re right, I’m updating as we speak. Regarding the update coming on Friday nights instead of a week night (it’s night here in Europe), it is surprising, but maybe Apple noticed with the first betas that no major issues ever turned up, and thought it was safe to propose the subsequent updates right before the weekend. Guessing this is an update to fix the security issue. If you had done your research, you would have known that the update on the 19th fixed those bugs. Didn’t know we were paid to do any research. What’s the going hourly rate…? It’s the inverse — you pay Apple $99/year to do research for them.